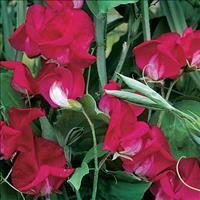 An antique fragrant sweet pea with silvery white striping on cherry-red. First offered in 1896 by Morse-Vaughan, we are proud to offer them once again. Seeds poisonous. 2-3 plants per pot. 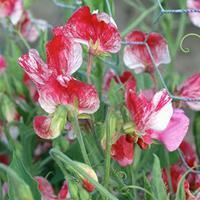 Lest intoxicatingly fragrant sweet peas become a flower of the past, Keith Hammet is breeding new varieties with all the spice of the originals. 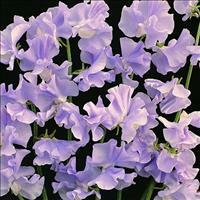 'April in Paris' has lavender kissed edges on creamy white and is the most sought after new variety in ages. 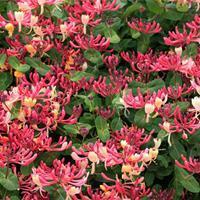 One of the best modern Spencers, this award winner is a strong garden performer. 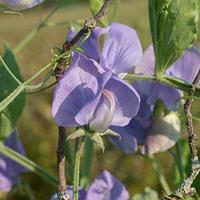 Silky flowers of tender blue are long-stemmed, wavy and highly scented of orange blossoms and honey. Seeds poisonous. 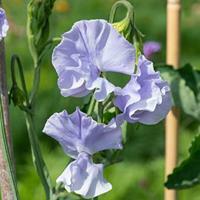 Clusters of frilly pale lavender blue flowers are perfect for luscious bouquets. Seeds poisonous. 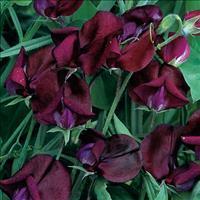 A fragrant bicolor in marvelous, opalescent shades of purple and deep blue. 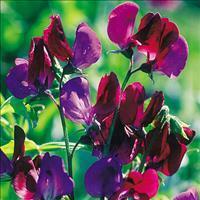 Not fussy like some modern Spencers, this classic can tolerate warmer summer temperatures too. Seeds poisonous. 2-3 plants per pot.